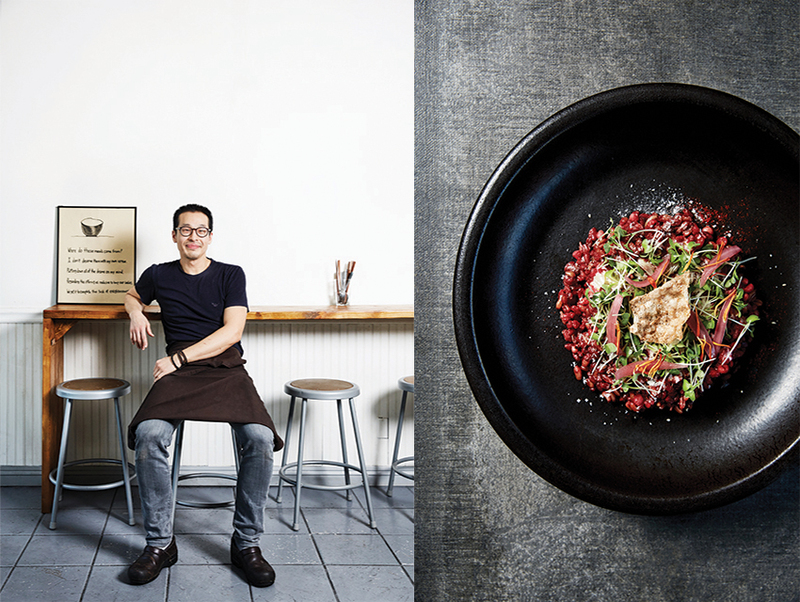 I aim for anonymity when I’m on the job, but I had to join Uh at the stove to understand how he creates the addictive umami burst of the food at this tight hole-in-the-mall joint he runs with friend Matthew Kim in Hollywood. I’m particularly interested in the noorook, which is kind of a risotto made from a trio of grains: farro, Khorasan wheat, and Job’s tears, a grass seed that is roasted and used for tea in Korea. The dashi broth Uh heated them in and the yon-do, a vegetable stock soy he splashes in, are part of the secret, but the driving force is koji. Often made from fermented rice and then powderized, the bacterial culture is central to sake and miso. Right before serving, Uh sprinkles on a store-bought variety for an effect similar to fleur de sel with an enzymatic kick. But before that, as the dish is still warming, he incorporates a koji that he propagates from spelt and buckwheat, resulting in a flavor that’s earthy and absolute, sort of what guanciale is to the Sunday roast. When I ask how he makes it, Uh points to the top of a box freezer. 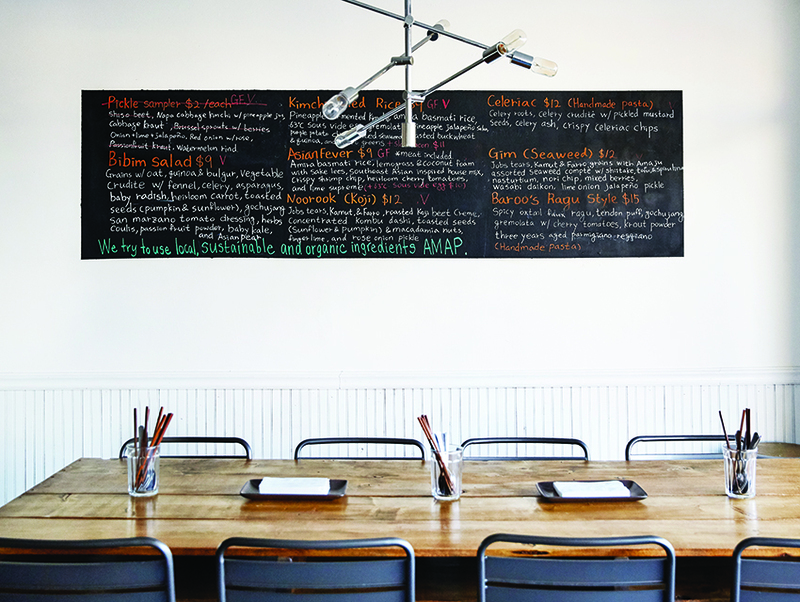 In another restaurant the appliance might be purring; at Baroo it’s left unplugged and functions as a shelf in the cramped space but also as an incubator, a drugstore heating pad elevating the temperature inside just so. The notion that such “big” food could come out of such a modest space is intoxicating to anyone on the hunt for the next great flavor in this city. But that only partly explains the bicoastal hype that has surrounded Baroo since it opened in September; the place is an obsession given an address, a passion project you can check out with a $12 bowl. Small crowds gather at the metal security grate before the restaurant’s noon opening. Inside the spare white storefront is a communal table and a dozen or so high stools along a couple of counters. Shelves are arranged with fizzy jars and trays of grains trailing digital temperature probes. The counter closest to the kitchen is stacked with heavily annotated texts by Pascal Barbot of Astrance, France’s Michel Bras, and Argentina’s Francis Mellman for inquiring browsers. The blackboard lists such intriguing ingredients as sake lees (the stuff at the bottom of the barrel) and kraut powder, hinting that although a Korean palate might anchor the cooking, the vision extends to something much more broad. It’s pretty neat that the yellow aji peppers and the hamachi tiradito introduced on La Cienega at Matsuhisa in the 1980s helped lead to Baroo and its seemingly unrelated fixation on fermentation. Uh is riding the cross-cultural connections between, say, Armenian yogurt, Vietnamese fish sauce, and the garlic dills the Kruegermann family has been making since the 1960s in a warehouse by the L.A. River. He’s far from the only chef captivated by microbial preservation—if you have any doubt, look at the carrots preserved in cider vinegar brine decorating the walls at Bruce Kalman’s Union or dip into Jessica Koslow’s “lacto-fermented” hot sauce at Sqirl. But nobody who’s grappling with these ancient traditions is pushing flavors into the intense realm that Uh does. His artistry lies in the skill with which he can lend airiness to grains sprouting downy microflora as he contrasts the funky with the fresh, the fermented with the raw. So in the bibim salad, a watercress coulis and ribbons of radish lightly dressed in olive oil temper the porridge of oats and quinoa that Uh has boosted with gochujang (a soybean and aromatics paste Roy Choi has described as “post-apocalyptic glue”). The lime crème fraîche offers a similar balance when spooned over noorook. 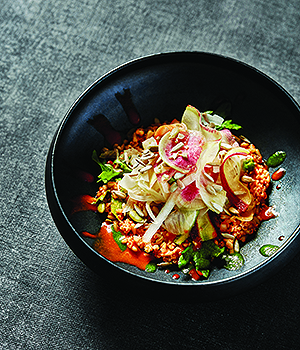 For another dish he adds champagne vinegar along with sweet-and-sour asazuke-no-moto to that building-block blend of Job’s tears, Khorasan wheat, and farro. Uh will tack on a dark sludge of three kinds of stewed seaweed, too. After that he hits the grains—tataki style—with a widemouthed blowtorch, transforming what could seem unappetizing into something as warm and compelling as campfire toast. Providing an extra hint of the ethereal, Uh likes to serve a few chips made from boba, flavored with pureed shrimp or saffron and dried at low temperature. I’m less taken with the sliced blueberries he adorns creations with—a move that’s more Cheesecake Factory than Noma—but in constantly modulating the old and the new, he’s unfailingly interesting with his offerings. Those customers who want a more gradual introduction to funk might opt for tagliatelle bathed with pureed celery, in which pickled mustard seeds are the only things that have been fermented, their bite accenting the fillip of dashi (rounded out with beurre noisette) that Uh slips in. Such deftness is key when he’s pushing the envelope. We may like to see things linked to the primal pond, but that doesn’t mean we want to drink from it. For dessert you can get a few bars of shortbread—a Tartine Bakery recipe Uh updated with candied yuzu. Complimentary teas are kept by the hot water dispenser. During service, as Uh works the stove, Kim takes most of the orders, clears the dishes if he has time, and occasionally replenishes the glass-doored fridge with Dixie cups that have been filled with elderflower-flavored kombucha. If there’s a white Prius by the door, it’s probably his. And if there’s a run on the drinks, you may well see Kim head out to his car, a rolling storage unit with Smart & Final supplies, to fetch some more Dixie cups. This is not a restaurant to stand on ceremony as it strives for the higher conceptual reaches. Previous articleAsk Chris: Who Are the Two Men on the Mural Looming Over the Yoshinoya at Wilshire and Alvarado?